While Android is surely catching up, it still cannot beat the iPad, when it comes to tablet optimised apps. The iPad boasts of a stellar number of apps that are optimised for it. The iPad is a great travel companion, it’s portable and thanks to the cellular models, it keeps you connected anywhere, anytime! To aide your travel, the App Store features a number of quality travel apps for the iPad, that you are going to love if you are indeed a road warrior. 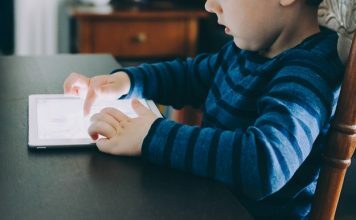 It’s tough and confusing to choose between those plethora of apps, so worry not, as list you today the top 10 travel apps for the iPad. If you want a great travel companion for your iPad, the City Maps 2Go Pro is just the app for you. There are both paid and free versions of the app available. If you are a constant traveller abroad, we’ll suggest you go ahead with the Pro/Paid version of the app. The Pro version of the app gives you unlimited access and any number of destinations you want while the free version is limited to five destinations you choose. 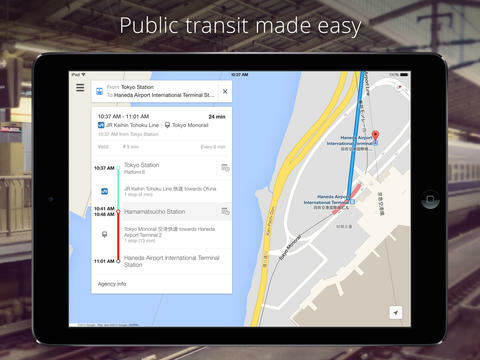 City Maps 2 Go brings offline maps, which should be great when you don’t have an internet connection on your iPad. The app brings worldwide coverage, in-depth travel content, search and discovery, tips, recommendations. You can also plan your trips and customize the apps to suite your needs. 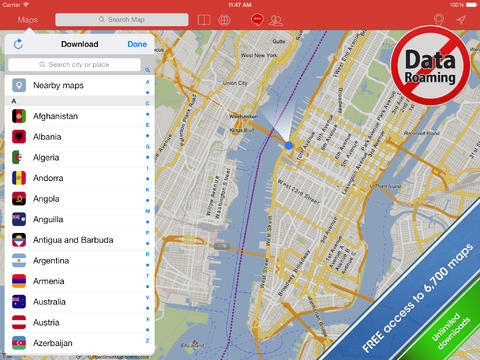 The app features sync ability, so you should be able to see your map data on your iPhone too. The app is available for iOS 7 or later and the Pro version cost INR 190. The Kayak app is a great search app if you are travelling to a new place. The app lets you search for almost everything you need in a new city. You can go ahead and search for Hotels, flights. You can search and book cars, The app also brings a flight tracker and itinerary management. The app works great and fast. You will be presented with various details while you search for something. For example, if you search for a hotel, you will get the various details such as the complete address, the distance from you, its ratings and the price rate. The app is compatible with iOS 7 and later and it’s available for free over at the App Store. If you are indeed a travel junkie, then you must already be aware of TripAdvisor. 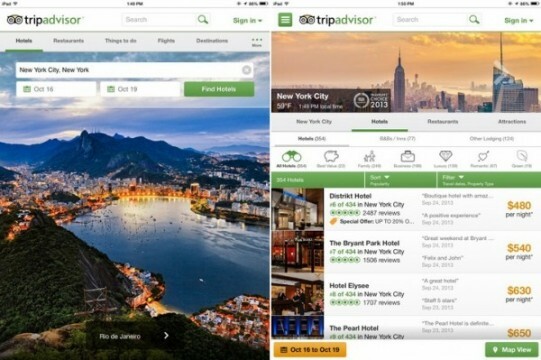 The TripAdvisor apps is the best app to plan a perfect trip for you. The app brings you a number of great features, which you are going to love if you love trips and travelling to new places. The TripAdvisor app boasts of millions of reviews, opinions, videos and candid photos by travelers, so if you’re going to a new place, you might want to check them out. 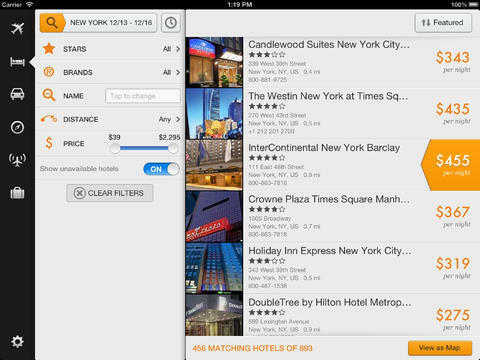 The app lets you search for hotels, explore cool restaurants and happening places, the lowest airfare deals and more. There’s a Near Me Now feature that lets you discover places around your current location. Moreover, you can ask specific questions to a the traveler community at the Trip Advisor forum. The app requires iOS 6 or later and it’s available for free at the App Store. 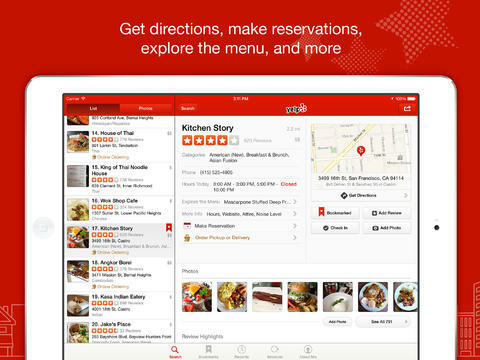 Yelp is a very popular app and it’s the local guide you would need on your iPad. The app is pretty great if you’re into exploring new places. Yelp lets you search for great local businesses and you can find the best place to eat, shop and enjoy near your current location. There’s also ability filter your searches based on rating, prices, distance and more. You can also choose to filter places by what’s open at that time. Along with the great discovery capabilities, the app brings you pictures of local places and rating, reviews from the locals, thus giving you a good and honest idea about a place. You can also check out the address of a place and get more details such as the phone number. You can add tips, pictures and more of your own for a place. Yelp is compatible with iOS 6 or later and it’s available for free, over at the App Store. We all know that Apple Maps is okay but still not good enough to compete against the likes of Google Maps and Nokia’s Here Maps. Google Maps is the best maps offering on iOS and if you are using an iPad, it’s a must have. Google Maps brings the awesome and accurately detailed maps for around 220 countries. There’s voice guided GPS navigation for walking, driving and biking. For the bikers, there’s elevation info as well. The app also brings you live traffic reports, automatic rerouting while navigatio and a lot more. If you’re in a new city, the transit directions and maps that Google Maps are a must have. With so many features, we don’t really need to say more and chances are you already have it on your iPad. If not, get it from the App Store for free. Google Maps requires iOS 6 or later. If you are a frequent traveller, the TripIt app for the iPad is a must have. It is the quickest way to organize and get going with a trip you’ve planned at the last minute. 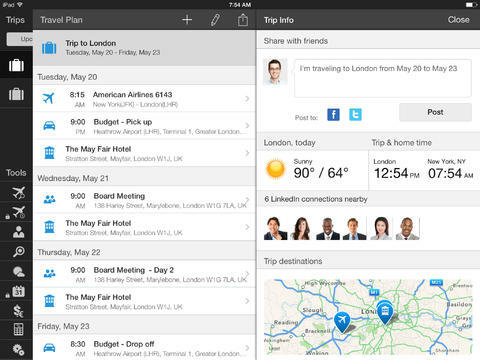 You can share all your trip information with TripIt over an email and the app will prepare a detailed daily itinerary. You can access these itineraries anytime you want and from multiple devices. The app also brings you maps, direction for places you want to go and weather reports for your destinations. There’s ability to sync your trip plans with Outlook, Google and Apple Calender. You can also share your trip plans on social networks or via email. 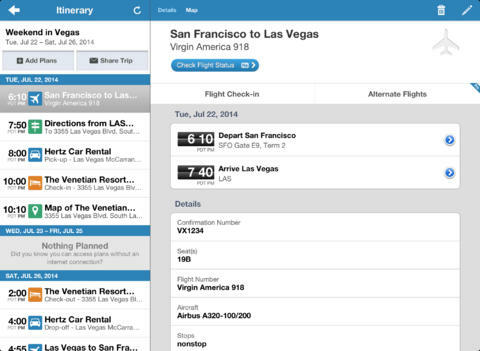 TripIt is a great app for people who travel frequently and want to keep things organized. The app is available in both a free and paid version. The paid/Pro version of the app features no-ads and it brings notifications for flight alerts, flight tracker and more. The paid version is available for Rs. 60 and the app requires iOS 6 or later. Love making sudden trips? 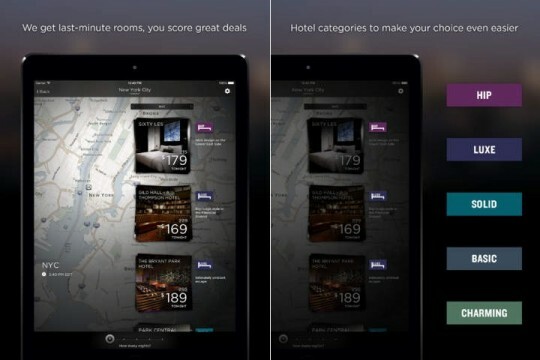 Hotel Tonight might just be the perfect app for you. As the name suggests, it finds you the best Hotel deals in a place for tonight. The app brings you deals that will be hard to find anywhere else. Hotel Tonight brings you a curated selection of hotels, that are top rated and have the best deals for you. The app supports a lot of countries, so it should be helpful for people who make frequent visits abroad. So, if you want a Hotel room at the last minute, Hotel Tonight should get you one and that too at a great price. Hotel Tonight is available for free at the App Store and it requires iOS 7 and above. While we talked about a lot of trip planner apps, discovery apps, here’s something that you might really come in handy when you’re travelling to a different country. XE Currency is a cool little app that shows you the current currency rates from every country. 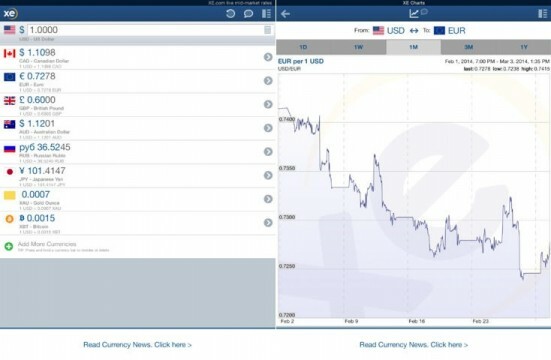 XE Currency offers currency charts from different countries that refresh every minute and the app saves the last updated info if you don’t have an internet connection. 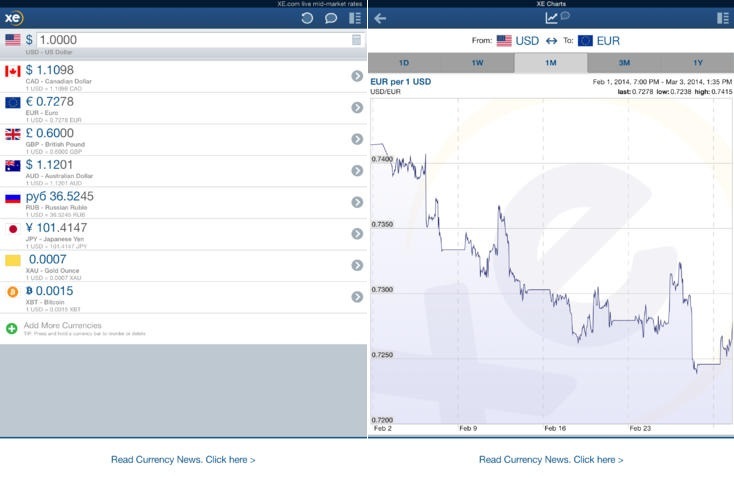 There are a lot of features in the app, the notable ones being the currency converter, which lets you calculate prices in different countries’ currency. There’s ability to monitor 10 currencies simultaneously. The app should be pretty handy for people who travel to different countries a lot for business purposes. The app is available for free on the App Store and it requires iOS 6 or later. There are times when you are travelling to a country or a state, where the main language is a language you are not well versed with and that’s where Pixter Scanner comes into play. 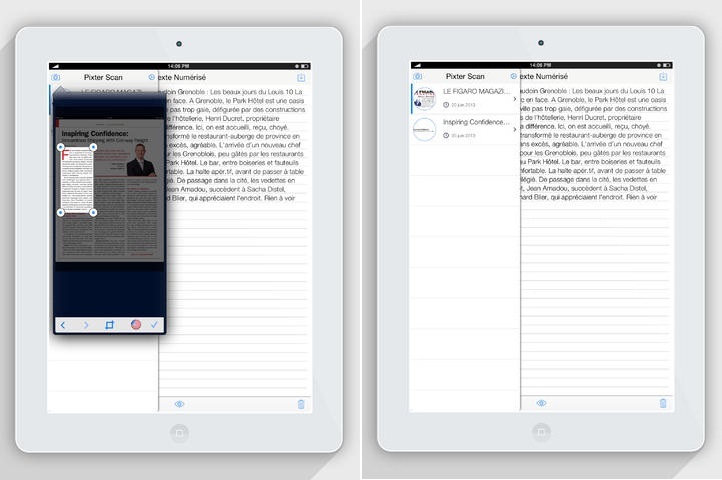 This app extracts texts from pictures by using optical character recognition. The app is great if you’re not able to read signs and name of the places in a foreign country with a foreign language. Sounds pretty great, right? Don’t worry, as the app works pretty great too. The app can also be used to bring a handwritten data into digital form. You should definitely check out the app on your iPad. Pixter Scanner requires iOS 7 or later and is available for Rs. 190 at the App Store. WorldMate lets you completely rely on an app for your trip. You can plan your trip, make you booking and manage every aspect of your trip using just a single app, that’s WorldMate. The WorldMate itinerary lets you organize your flights, your hotel and car bookings, your business meetings and transportation. The app also offers maps and directions to your destinations on a trip. The Travel Dashboard presents you with all the information you need at one place. There are a plethora of other features, which make it a great all in one travel app. The WorldMate apps comes in a free as well as a paid version. 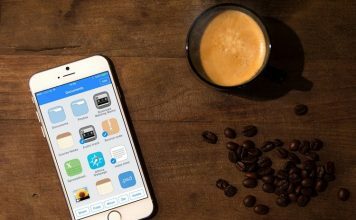 The paid version is known as the WorldMate Gold and it brings flight alerts notifications, real time flight status, sync with your iPhone and no ads. The app also 3 months of Gold subscription every time you book a Hotel through the app. WorldMate requires iOS 6 or later and the Gold version is available for Rs. 620 on the App Store. Well, that’s our list for the Top 10 travel apps for the iPad. What about you? Tell us your favorite travel apps for the iPad.. And yes, don’t forget to check out our other Top 10’s.